Spirulina -- a form of edible algae sold as a health food and dietary supplement -- is of particular interest to bodybuilders. Bodybuilders who take spirulina believe it can boost the immune system, enhance athletic performance, promote recovery from intense workouts and control weight. Although preliminary research is promising, clinical evidence regarding spirulina's efficacy is limited, and more study is needed. Consult your doctor before adding spirulina to your diet. Spirulina, scientifically known as Arthrospira platensis, is a variety of blue-green algae that grows in high-salt alkaline water in subtropical and tropical areas. Indigenous to Africa and Asia, spirulina is commercially cultivated in California and Mexico, often imparting a dark green color to bodies of water in which it is grown. Commercially available in the form of pills, powders and flakes, spirulina has been used as a food by many different cultures for centuries. Drugs.com notes that Spanish explorers wrote about Aztec Indians gathering a blue mud that very likely contained spirulina; it has also been harvested in the Sahara Desert, where it is known as dihe. Spirulina is not only edible but extremely nutritious. It contains 65 percent protein, which is important to bodybuilders looking to eat a high-protein diet to build muscle. Spirulina also has high levels of B-complex vitamins, vitamin E, beta-carotene and zeaxanthin. It also contains the beneficial essential fatty acid gamma linolenic acid, which is rich in bioavailable iron. Other constituents are the minerals calcium, potassium and magnesium, as well as the trace elements manganese, selenium and zinc. Spirulina may have the ability to enhance your immune system. Drugs.com reports on a human study that found taking spirulina increases natural killer cells and interferon. Other studies cited by Drugs.com showed that spirulina has antiviral properties in vitro, inhibiting viruses like herpes simplex and HIV-1. Spirulina has detoxifying effects, helping to increase urinary excretion of arsenic in people with chronic exposure, and was found to increase hemoglobin levels in malnourished children in West Africa. Perhaps of most relevance to bodybuilders, a study published in the 2006 issue of "European Journal of Applied Physiology" recorded the reactions of volunteers who underwent a physically demanding treadmill exercise after taking spirulina for three weeks. Researchers found that spirulina prevented damage to skeletal muscles, allowing the subjects to postpone the time of exhaustion during all-out exercise, thereby working out longer and harder before becoming fatigued. The standard dose for spirulina is four to six 500 mg tablets per day. The algae is considered nontoxic at usual levels of human consumption, and very few adverse effects have reported. However, the University of Maryland Medical Center cautions that spirulina can be contaminated with toxic substances called microcystins. It can also absorb heavy metals if any are present in the water in which it is grown. 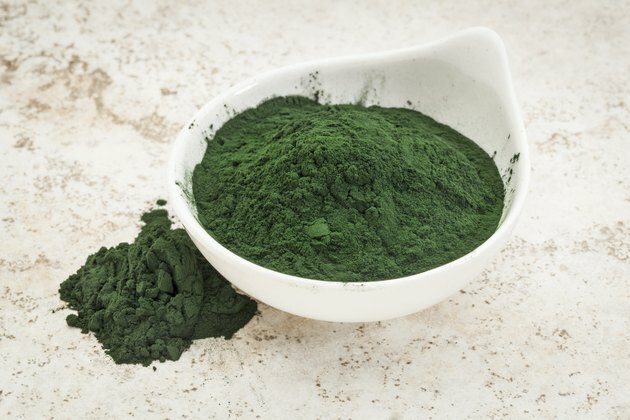 To ensure that you are buying safe spirulina, purchase it from a reputable health food store. If you have an autoimmune disease -- or the metabolic condition known as phenylketonuia -- don't take spirulina. Consult your doctor before using spirulina. Don't take it if you are pregnant or breastfeeding.